Older: Russia’s Occupation of Crimea: Blueprint for Eastern Ukraine? 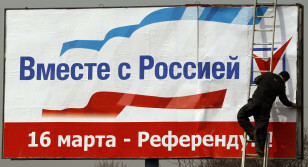 A worker puts up a poster that reads, “Together with Russia” in Simferopol, Ukraine. The West has interfered massively in Ukraine. Last year, about 15 percent of Russian adults traveled outside the former Soviet Union. By contrast, about one third of Ukrainians between ages of 20 and 50 have traveled to Western Europe – to work. That is the difference between peeling off a 10 Euro note to pay for a caffe latte in Prague, and waiting tables for tips in a Czech coffee shop. Or hailing a cab in Vienna, and cruising for fares in Vienna. Or enjoying a modern shopping center in Berlin, and building it. When residents of Moscow, capital of Saudi Arabia of the North, sneer that all the EU offers the Ukraine are jobs as bellhops, chamber maids and construction workers, many Ukrainians respond – fine, that is a start. As a former bellhop in a Swiss hotel (Hotel Elite, Bienne, 1974), I wholeheartedly agree with them. Since the Berlin Wall fell, Ukrainians have watched the economy of neighboring Poland increase four fold, while Ukraine’s economy flat lined for a generation. The difference? Poland joined the EU and got a massive influx of capital from neighboring Germany. Ukraine suffered under a generation of misrule (including by Saintly Yulia Tymoshenko). Oligarchs created monopolies and then drained billions out of Ukraine. Labor followed this capital outflow to the West. So Ukrainians have lived and worked in the European Union. Unlike Russian tourists, they have not skated over the surface, skipping from Florence to Barcelona to the Riviera. Ukrainians like what they saw, starting with the rule of law. In short, Russia has lost the hearts and minds of the majority of Ukrainians to the West. They are not coming back. A realist, Putin now settles for second best – destabilizing Ukraine by laboring to exacerbate linguistic and ethnic tensions. The Kremlin’s strategy is to surround itself with weak and divided states. Ever wonder why there is no solution in sight for Moldova’s breakaway region of TransDniester Republic? For Georgia’s secessionist regions of Abkhazia and South Ossetia? For the Azeri-Armenian dispute over Nagorno Karabagh? Very simple: the EU and NATO will not accept as members countries with territorial disputes. So now, Ukraine joins the list of former Soviet republics kept weakened and on the defensive by Kremlin policy. Crimea exemplifies a zero sum view of the world that Russian foreign policy makers have adopted without much change from their Soviet predecessors. If you are up, I am down. If I am up, you are down. In North American terms, Russia’s work in Crimea would be comparable to Washington fomenting separatism in Quebec to split up and weaken Canada, or funding rebellion in southern Mexico, to put Mexico on the defensive. Instead, the American people and their policy makers believe that the successes of Canada and Mexico are pluses for the United States. Hence the North American Free Trade Agreement, a voluntary association of democracies that, like the European Union, is designed to raise all boats. Which leads to Putin’s Eurasian Union, a Moscow-led Dictators ‘R Us club. Maybe after gobbling up Crimea, Putin will grab parts of Eastern Ukraine and create a rump Ukrainian state that can bring Ukraine’s industrial heartland into the Eurasian Union. 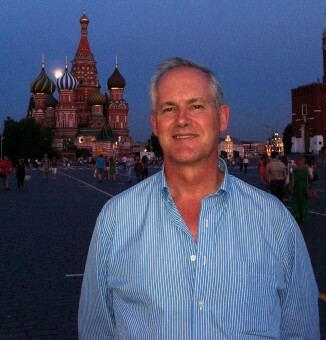 Inside Russia, Putin tighten controls on the press and on the dwindling right to protest. Russia is becoming a big Belarus. The last thing Putin’s authoritarian regime wants is a Slavic success story on its Western border – a thriving democratic Ukraine. Watch the imposition of Putinism in Crimea: the independent press is shut down, YouTube videos show masked men beating up journalists, and pro-Ukraine rallies are broken up. Sunday’s plebiscite on the future of Crimea looks like a modern version of the various post war votes in Hungary, Poland and Czechoslovakia that “endorsed” forced transitions to communism. After 7.5 years living in Moscow, my conclusion is that the only language the Kremlin understands is the credible threat of force. It is no accident that Russian was not the foreign language taught on the eastern bank of the English Channel from 1950 to 1990. Boring, but true, it was NATO that stopped Moscow’s expansion westward. Without the credible threat of counterforce, a stop sign is just an annoyance to a Russian tank. Just look at Crimea. Today, were it not for NATO, the Russian bear would sneeze and blow the democracies of Estonia, Latvia and Lithuania into the Baltic Sea. As a New Englander, I know that good fences make good neighbors, (See Robert Frost poem). But the Russian people largely inhabit a large plain, with few mountain ranges (fences) to protect them. Over the centuries, Russia’s borders have expanded and contracted like an amoeba. With Russia’s occupation of Crimea, a new chapter opens in the relations between Russia and the West. 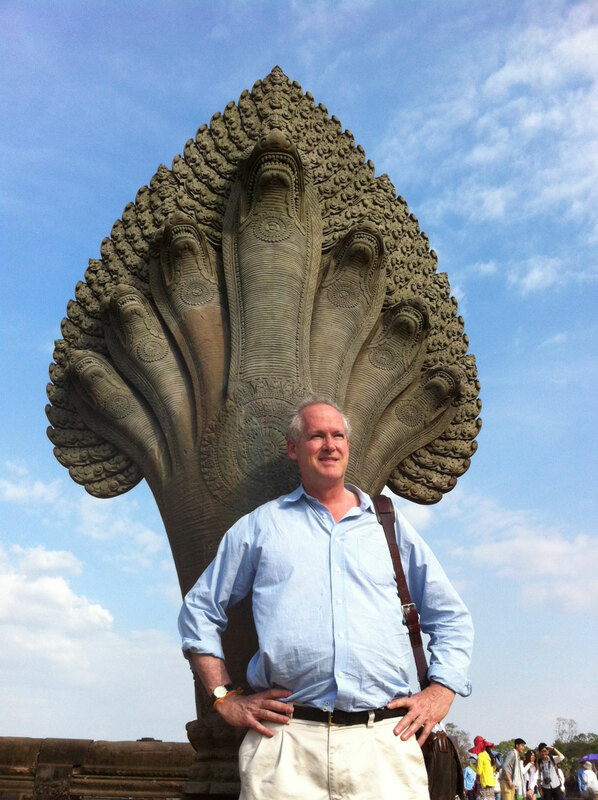 Jim Brooke at Angkor Wat in Cambodia. I am leaving to others more eloquent than I to chronicle this new chapter. I write these lines while on vacation in Mae Sot, Thailand, on the Burmese border. On March 17, I start a new job, as editor-in-chief of The Cambodia Daily, a privately owned newspaper printed in English and Khmer, with an editorial staff of 50. So I am trading Moscow for the Mekong. My best wishes to all my readers of the last three years! 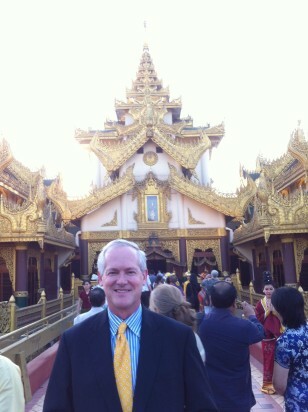 Jim Brooke in Yangon. Based in Phnom Penh, Brooke will also work as editor in chief of The Burma Daily, a new website. I didn’t know that NATO won’t allow countries to enter it that have border disputes. Considering how Russia acts, it’s probably best for NATO to scrap that rule. Countries in Europe can’t have confidence of their ability to control their own destinies without NATO membership. Where were that NATO, during an Iraq occupation? Congratulations on your new post. You will be missed. A very nice article. Thank you Jim! Scotland is getting itself ready to leave the so called United Kingdom. Will Britain try to avert the will and longing of the Scotish people in the name of Unity? Gone are the days when the Sun Never sat in the British Empire The Crimeanain vote loud and clear to leave Ukraine. I see a difference between the leadership in Russia and Britain. It is callled democracy. @ Mattias – So True!!!! @Ram Goda – *…The “Crimea” vote loud and clear to leave Ukraine* ??? Better do some serious fact checking first. Also, the Tatar community’s Point of View is very noteworthy here as well. ….the peninsula (Crimea) was made slightly less autonomous by its annexation via a SHAM “referendum” under the gun of occupying forces from the Russian Federation…..
….The genuine leader of this (Tatar) community is a Soviet-era dissident and much-revered former chairman of the Mejlis, Mustapha Cemilev. ….The vast majority of Tatars not only reject annexation and boycotted [last week’s] “referendum,” but also consider themselves aligned with fundamental tenets of Ukrainian nationalism. As Bakkalli puts it, “the steppe regions of Ukraine are Crimea; Crimea is Ukraine.” Accordingly, the Tatars backed the Orange Revolution in 2004 and they supported the Euromaidan protests which ousted corrupt Ukrainian President Viktor Yanukovych in late February…. NATO doesn’t care if it expands or contracts but the countries which were under Moscow’s heel since 1939 and after certainly do care. It is the only hope they have of not ending up back there again. Who will save us here in Ukraine? But-just hypothetical proposition-were we to have spent a fraction of the money squandered in Iraq on helping the newly reconstituted Russia to flourish so that the Russian people experienced a taste of new prosperity we would have saved ourselves and the world a fortune in aid -both military and other wise. Instead inquiring the Bush administration we sent more predatory type assistance designed to control and drain Russian resources for our benefit. In an environment of well fed and prosperous Russians democracy-of a type (we are still talking about Russia) with somewhat free market principles could have grown and flourished. What we helped create instead was an environment that perpetuated the underlying poverty of so many and provided fertile ground for the hard line generals and oligarchs to gain power. Putin had no option but to move in that direction to survive. The EU in its greed and the US in its incompetence have given us and the Russian people this current dangerous mess. Even more recently if we had helped Putin to save face and to restore some lost luster to the Russian people the situation could have been a victory for peace and prosperity for all concerned. That’s a very forthright piece and as I read you words, I said myself, “this guy is getting ready to be PNGd,” Sure enough, this is the kind of comment that could get you in big trouble at the Moscow MFA. Paul — I was always pretty blunt — and VOA never censored me. To illustrate how far Russia has moved to the extreme right, only 2 years ago, The Moscow News, a government owned weekly, was one of six newspapers in the region that ran Russia Watch. Orysia, I understand your screaming due to the *wiles and tactics of the devil next door*..
Where was NATO during the Iraq invasion? Worrying about the North Atlantic region and threats to places over there. NATO is a regional alliance; anything NATO members do outside NATO-specific operations is completely separate. “…… Babchenko says that such words in the mouth of the Russian president can be extended by him to “all THOSE THAT WORK FOR INDEPENDENT MEDIA or did before these were closed,” “who didn’t want war,” “who did not want a flood of caskets containing their children,” “who are for free elections,” and “who are against corruption and thievery..
Uh-huh. Time to hit the road. For sure, there are many who knew/experienced the same conclusion far longer than before 7 ½ years ago and had never set foot in Russia. I recall the adage – *There’s a fine line between intuition and paranoia. * I don’t think those people were ever believed but were thought to be basically only paranoid. Guess, now you know intuition is not over-rated, too.. The following has some strong language (unfortunately) but I wanted to share this little vid-song as a gift 4 you in parting. I thought you’d understand. And appreciate the humor as you looked back at your tenure with Russia Watch in Moscow. 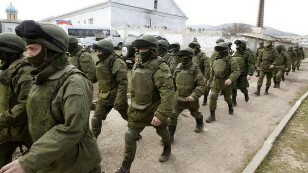 Moscow claims that it is not orchestrating the crowds of Crimea. Deciding on ownership of Crimea is a difficult question for Crimeans. When Russia and Ukraine (and some more countries) joined to form the Soviet Union, Crimea was still part of Russia. The general secretary of Soviet Union from 1953was Nikita Khrushchev, who was reportedly of Ukrainian national origin. Crimea jut’s outwards at the southern tip end of Ukraine like a “Jutland”. Crimea was reportedly transferred from maps of Russia to Ukraine by Khrushchev in 1954, as administering of Crimea from Kiev may be easier from Ukraine than from Moscow. This did not affect local life there for decades. However soon after the Soviet union was dissolved, Boris Yeltsin found himself in a difficult position and there were other pressing issues besides Russians in Crimea. Besides, all influencial officials had Ukraininn friends working as officials and officers in almost every government and neighbourhood of cities. Boris yeltsin just made a new Crimea agreement in 1994 to make Crimea a Russian speaking autonomous province within the map of Ukraine, as drawn decades earlier by Nikita Khrushchev. There is a reason why Russia is only interested in ethnic Russians of Crimea peninsula. Ethnic Russian Cossacks of Imperial Russian Army and Imperial navy were recruited in disproportionately high numbers from Crimean Russians (Cossacks) for the last three hundred years. Prior to joining imperial Russia, Cossacks used to wear European style dresses when they were at home near Crimea, and Cossacks used to dress like Turks and Islamic militants when they were at war, attacking Ottoman military installations while they are under Ottoman Islamic rule. There was a old saying that if one wanted a job in the Russian Imperial army, one had to claim to be a Cossack Russian from Crimea. When the Crimea came under the Ottoman Empire, ethnic Cossacks became part time resistance defenders and became more dispersed around the Caucasian region. Moscow has only recently started taking interest in Crimea because Crimean ethnic Russians had occasionally accused Moscow of selling out on the wishes and aspirations of Crimea to not be part of any other nation other than Moscow controlled Russia. However, having said that, I also think that present group of noisy ethnic Russians living in Crimea are probably not descendents of the original Cossack Russians of Crimea. What happened to Crimea could also happen to the East and South China Seas. Communist China could use the Crimea-model to further its bullying tactics and the occupation of territories belonging to its neighbors supported by a ridiculous 9-dash line it has been claiming as a basis. The only difference between Crimea and the countries involved in territorial dispute in the East and South China Seas, though, was that Crimea has chosen to be more tolerant to invasion while the countries in the East and South China Seas will never ever bow their heads to a greedy, bully dragon. Chinese leaders will still choose to pursue with their expansionist program and when that happens, war is inevitable by which to include the United States protecting her allies..